Enjoy outdoor recreation with our families and friends. Off Road Recreational Vehicles (ORRV’s). Secure and preserve access to recreational lands for all users. Sponsor and support fair laws and regulations concerning all ORRV’s. Provide safety and survival education and participate in search and rescue efforts. Finance and implement the marking of local trails, using color-coded reflective markers. Host and actively participate in educational programs in the schools, including promoting snowmachine and cold weather safety. Finance and maintain an active, trained search and rescue (SAR) team in Homer and Anchor Point, working "on call" through the Alaska State Troopers. Like anything in life, lots of things change. Snomads objectives have evolved too. Originally, in 1992, we were a group of volunteers with a love of the outdoors and winter snowmobile sports. Social activities were held at a variety of places in the Caribou Hills. It seemed like there was always time for another event, charity, rides and runs abounded. Trail grooming was done where members decided it would make a great ride. Volunteers cleared trails at will. It was a carefree time. Club members built a clubhouse and an auxiliary building. Appropriately, they are referred to as the Palace and the Pavilion. These buildings and land are where most of our club activities occur. Members came from all directions of the community to enjoy the events here. Of course with the pride of ownership, came more responsibility. With budgets becoming more fiscally constrained, we had to budget more responsibly. More people came to live in the Homer area. Land use conflict was on the horizon. Snomads became involved in a court case involving easements. We began to realize that we could not groom areas now that we had groomed before. Land and trail issues came to the forefront. We began to apply for grooming and trail grants, attending community meetings to secure funding for all kinds of projects to benefit our community. We now regularly groom trails from which we receive our grant support. As long as we have volunteers to support the grooming, we will groom. Funding and grants allowed us to expand into other areas. We support a Search & Rescue team on call by the Troopers. We built Willard Rd., a borough maintained road 3/4 mile long, from a cowpath trail. With our great volunteer force, this was done over a 3 year period and was completed in October 2012. This road goes to a public trailhead called Caribou Lake Trailhead (or Blue Shed 2). We lease and maintain other public trailheads, while working to acquire historic trails. Kids in the community look forward to riding our 120cc club snowmobiles. Did you know that we are the only club in the nation with these and that they are free at our communities events. Greater funding allowed us to hire a trail consultant. We have formed alliances with other organizations. We even sponsor a dog mushing checkpoint! Yes, we still like our events too! In short, we have come from a club which was purely for fun, to an active force of volunteers willing to make our community better. If its snow, Snomads has something to do with it and we encourage your families participation. Member Events - We have events for all ages. 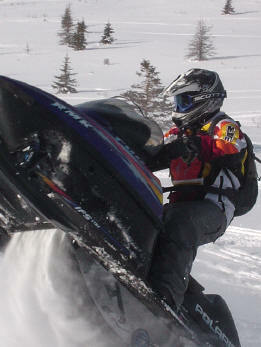 Our club has 120cc snowmachines free for use at our youth oriented events. Snomads is also involved with sled dog and skiing events.